This article is part of a multiple-part series. Click here to start at the beginning. So, we’ve all heard of, or maybe even participated in, situations in where an opportunity arises to reduce the costs of expenditures but the opportunity is not acted on because it will reduce your budget next year. Executives and managers like to pretend this doesn’t happen but the truth is that it happens way more than they’d be comfortable knowing about. Governments are famous for this type of blow-the-budget behavior, even down to the local township level. My first exposure to this was while I was a teen. I used to live in a nice newer home neighborhood on the first block of a 2 year old paved street. However, right before the end of the fiscal year, I came home from school one day to learn that my neighbors and I now lived on a loose oil and gravel road. Anyone that even remotely cares about the appearance of their car knows the joys of driving down an oil-graveled street, let alone living on one. After many town hall meetings and lots of citizen complaints, it was uncovered that a decision was made by the head of the township’s transportation and public works department to burn through 100% of the town’s inventory of gravel, stone, salt and other treatment supplies by any means necessary. This led to road crews randomly picking nearby roads to repave, gravel or dump supplies on, regardless of their need for repair. The reason behind it was tied to budgets. Very simply, if the township had any remaining supplies from the prior year, then their subsequent year’s materials and supplies budget would be reduced by a proportionate amount. In their defense, it’s slightly more complicated than that. Material costs had risen approximately 10% from the prior year. They had an inventory left over of about 30% excess materials. The way it was explained is that their budget would have been reduced by 30% because they forecasted for too much the prior year. However, to replenish the 70% supply at the new higher pricing, they would need a minimum of 77% (because of material price increase) of the budget they used the prior year, not the 70% that was would have been them using the standard budgeting method. The department head did what he thought was best to make sure that he did not have a budget overrun the next year, regardless of actual needs and certainly irrespective of tax payer dollars. But, in some weird way, you understand why he did it and maybe even sympathize a bit with his decision. The approved methods for developing and approving budgets in this circumstance led to a decision that ultimately cost tax payers a lot of money and created unhappy citizens. Now, you could argue that the department head did not do his job properly if he was not adequately capable of “fighting the power” and proving why he needed more money in year 2. He would have had an uphill battle, changing approved business methods and perhaps even legislation. But, at the end of the day, he was never hired for that role, he was hired because he is supposed to know how to properly manage the resources and scheduling of public works infrastructure. So, again, you can sympathize a bit with his reasoning to do what he did, even though it ultimately cost tax payers money. You may be saying that this sample doesn’t apply to you. “That’s government; they don’t know what they are doing”. 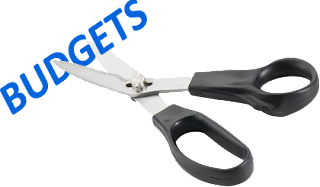 But the lesson isn’t about relating their screwed up budget approval process to your own, it’s that most organizations DO expect their department managers, executives, and even stakeholders to burn up time going through the budgeting and budgeting approval process. These people aren’t necessarily qualified to be fighting the budgeting fight, and they are almost certainly better suited in fulfilling their roles that they were hired to fill, whether that is scheduling hourly workers or ordering maintenance parts for the shop floor. At the end of the day, those people that you are burdening with budgets are going to protect their own interests. They are going to do what they need to do to make sure they have the funds to keep their department operating smoothly. If that means that the company spends a bit more, so be it, they usually are measured against their budget and their output, not against the impact to the bottom line. Maybe this government budgeting example doesn’t work for you, or you say it doesn’t apply. Let’s take a look at a different, more complicated business example from a conversation we just had last week. Read our second budgeting case study.